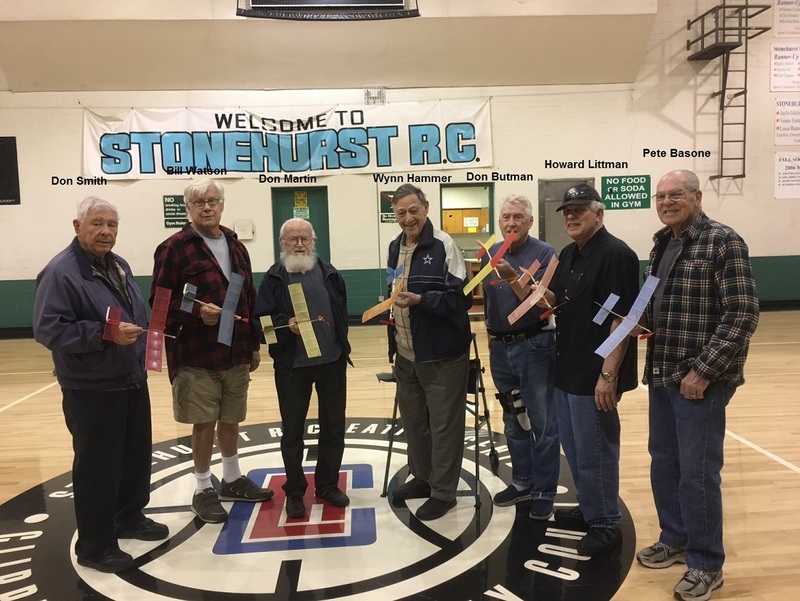 Stick and Tissue Forum - Indoor Flying With The O.F.F.C. 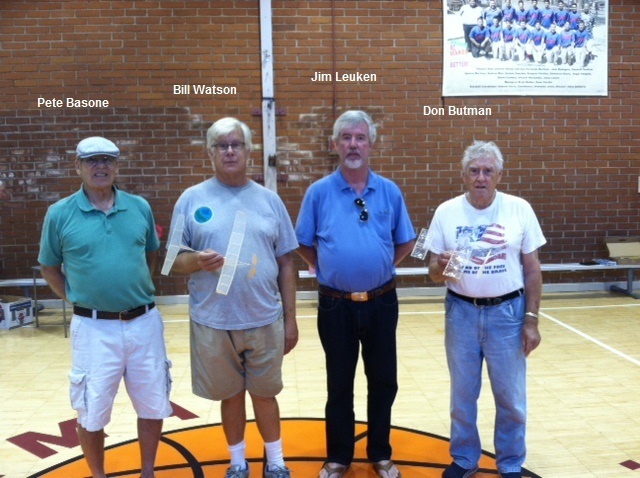 Stick and Tissue Forum › News of local and club events and activities. › Coverage of events in your locale. 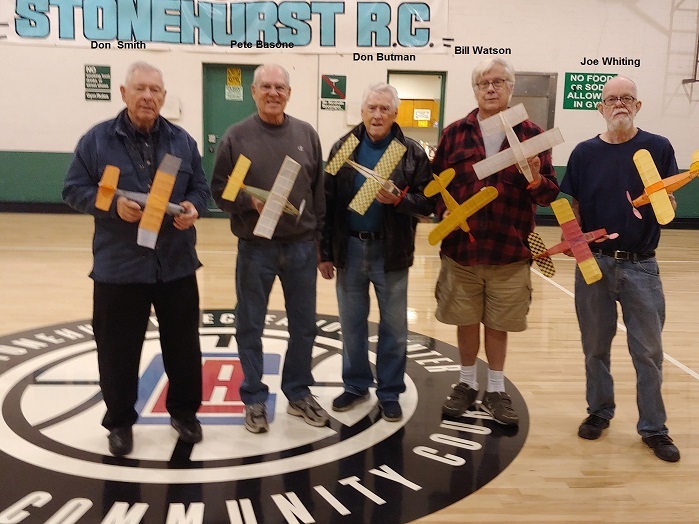 › Indoor Flying With The O.F.F.C. 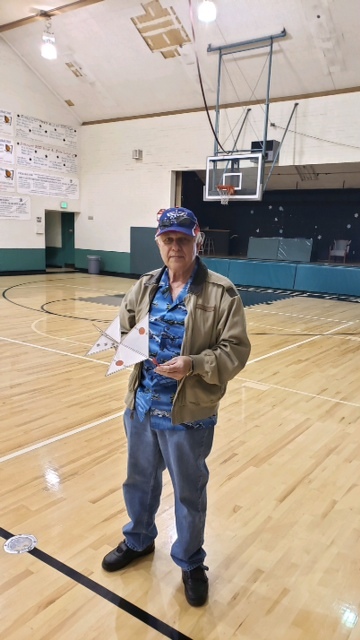 Here are more pictures from the Delta Dart contest. Sounds like fun, I look forward to seeing your post of the meet and the results. Thanks for posting! Got an email from Jim. The rule about the flight without the weight will be eliminated. It really doesn't prove anything and would be a waste of time at the contest. 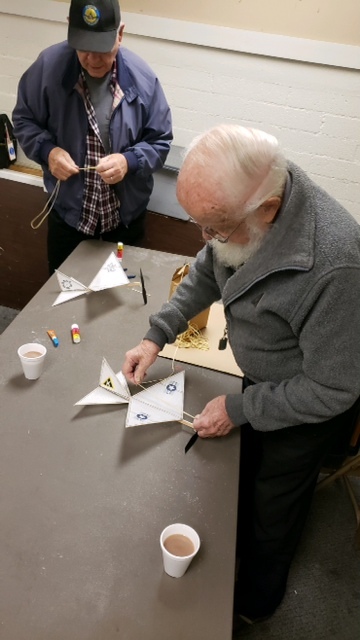 The pictures are Pete Basone waiting his turn to fly, Bill Watson with his new model, Bill's Bostonian T-craft, the timing table with Kurt Young, Stan Christopher, Hugh Langhans timing and John Veal watching. When I get the group picture I will post it. The only new models were the Zero by Bill Watson and the Heinkel 119 by Dave Gee. 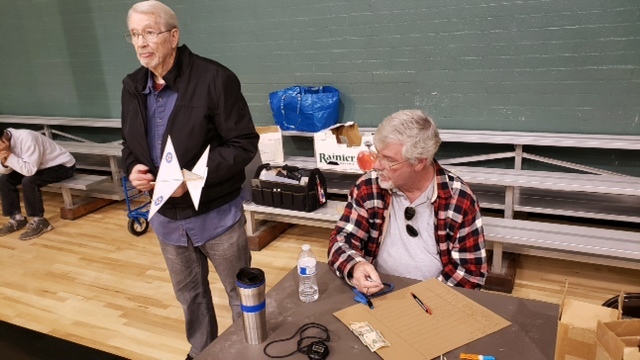 Bill also brought a Fike which is usually a "sure thing" at a No-Cal contest. The Heinkel, by proportion and layout, and at just over 5 grams, looked like a sure thing but proved almost impossible to trim. 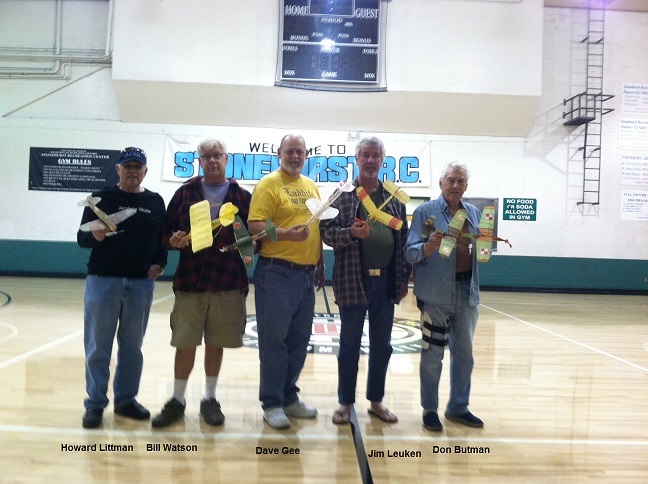 Jim Leuken brought a Bucker Jungmeister being proxy flown for Dave Saks. 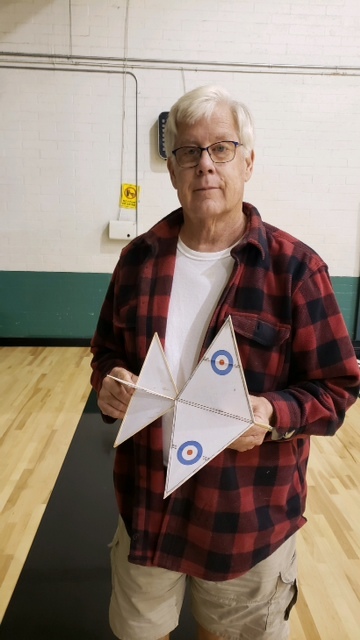 Jim Leuken's gentle flying Bleriot pusher (A model of the first airplane Bleriot actually got to fly, although the No-Cal model can stay in the air longer than the real airplane.) has been at previous contests and Don Butman's PZL (Actually, he, being a bit OCD, brought two of them.) is an extremely reliable flier. I was going to bring my new F2A to fly and trim for the upcoming Pearl Harbor contest, but since I had not built it yet I patched up my much trashed, old P-36/Hawk 75 with Scotch Tape and tissue and flew it. It appears that we will be in the Panorama City Park location for the next few weeks. The floor renovations at Stonehurst and Branford are going slowly. This is not good for the upcoming Unlimited Scale event since the Panorama venue is minimal size. At tomorrows meeting we will discuss the possibility of making it an outdoor event at Stonehurst. For the month of August the O.F.F.C. was a club in search of a venue. 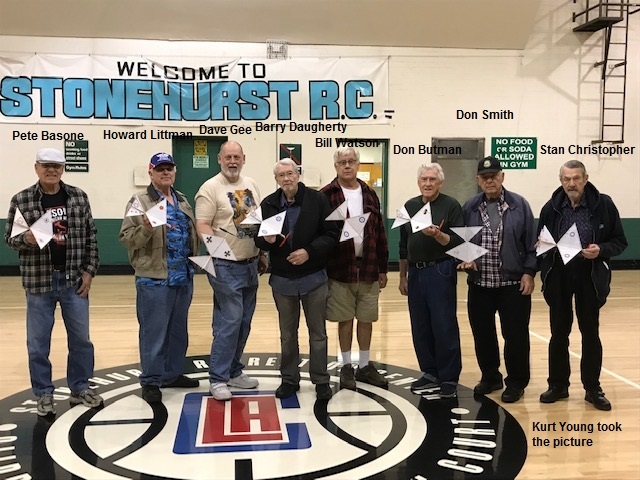 We were chased from the Stonehurst Rec Center because the gym floor was being replaced. The first two meetings were held outdoors, under the trees, on the Stonehurst field. This did not provide an environment for trimming an A6. 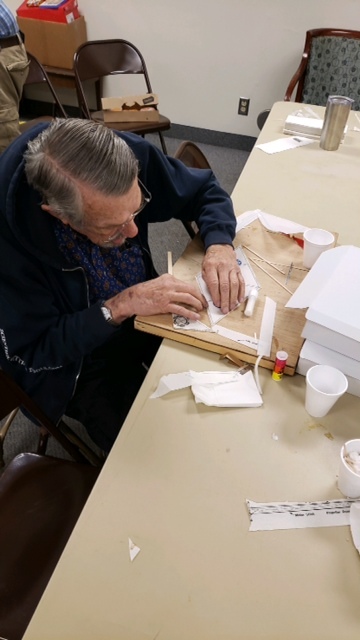 Thanks to the efforts of Don Martin and Kathy Mader from the Seniors Programs at the Parks Department we were able to hold the next two meetings at the Branford Park gym. Then we were barred from there because that gym floor was being refinished. So, effort was made again and we held the A6 contest at the Panorama Park rec center, probably the smallest venue we have held a contest. Howard Littman was the CD and along with Kurt Young and John Buntin did the timing. The next meeting will be on September 5th and, as far as we know, will be at the Panorama Park rec center, 8600 Hazeltine Ave, Panorama City.